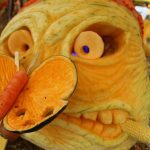 The Amazing Pumpkin Carve is the Hopewell Valley Arts Council’s BIGGEST event of the year — a five-day exhibition and celebration of giant carved pumpkins carved by local artists. We are thrilled this event has become a local autumn tradition. “slice of art” show • food trucks • performances and special events • s’more kits & cider • photo op-boards… and more! WHO: You, family, friends, and neighbors! WHERE: Woolsey Park, 221 Washington Crossing-Pennington Road, Titusville NJ (next to the Hopewell Township Public Works Building). 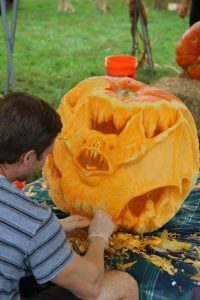 The 2018 Best in Show winner was awarded to Matt Derby for his carving “Blood Sucker.” (See photo) For complete list of winners, see this page. Harbat Farms • Liza and Sky Morehouse • Bristol-Myers Squibb • Capital Health • Central Jersey.com / Packet Media, LLC. • Community News Service LLC (formerly Mercer Space) • D’Angelo’s Italian Market • Everlasting Fence Company • Gelcor/Hopewell TC Management • Janssen Pharmaceutical Companies of Johnson & Johnson • Laurenti Family Trust • Northfield Bank • Rothman Orthopaedic Institute • Shier Tree Expert • The Bank of Princeton • The Pennington School • Thomas K. Fischer Builders • Trap Rock Industries • UBS • AJ Margulis Interiors • Buxton Boxes • Georgette Sturam Interior Design & Decoration • Callaway Henderson Sotheby’s International Realty • ICI Furniture & Flooring • Michelle Needham of Gloria Nilson & Company • Lisa and Phil Caton • Lynne’s Electrolysis @DornerHealth • MercerMe • Mid-State Equipment Company • Morpeth Contemporary • Princeton Air • Southwind Farms • Stellitano Heating & Air Conditioning • Stevens & Lee • Zeldis Research Associates • A&E Construction & Design Center • Kollevoll & Associates, LLC • Law Office of Alisandra Carnevale • Pennington Quality Market • Thank you to Pennington Bagel & Wegman’s for helping to keep our carvers nourished during the long carving day! Endless thanks to our amazing sponsors! The winner of the Community Partner award for their amazing scarecrow created by Anne Nixon-Ellery for the Friends of Hopewell Valley Open Space! For complete list of winners, see this page.